There are critical decisions being made this fall about the future of New England’s marine protected areas. In May, I signed on for my second hitch as first officer aboard American Promise, a 60-footer made famous by Dodge Morgan, who broke the solo non-stop circumnavigation record in 1986. Now owned by Rozalia Project for a Clean Ocean, she is their platform for coastal marine debris cleanup, pollution research, public outreach and a host vessel for visiting scientists. This time we weren’t heading to trash-ridden islands along the New England coast. We were heading out 80 miles into the middle of the Gulf Of Maine to a place called Cashes Ledge, on a mission called Expedition PROTECT. Cashes Ledge is an underwater mountain range. Its steep peaks lift from a basin hundreds of feet deep to within 40 feet of the surface. This topography interrupts the Gulf of Maine current and allows nutrient- and oxygen-rich waters to mix at a depth exposed to sunlight. This phenomenon, known as internal waves, carries phytoplankton-rich water from the surface to the sea floor. This unusual pattern results in ideal conditions for abundant and diverse marine life. Who knew we have beautiful, lush kelp forests in the Gulf Of Maine? I surely did not! 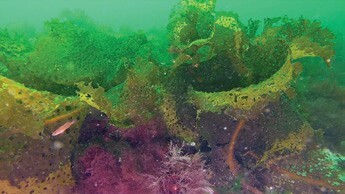 But it is here on Cashes Ledge that we find the largest kelp forests on the Atlantic coast. Kelp provides an ideal habitat and food source for a large and diverse population of ocean wildlife. The Cashes Ledge area is a nursery and refuge for important New England fish species like cod, pollock, Atlantic halibut, and white hake. It is also home to some very rare species like Atlantic wolffish, blue sponge, and red cod. The abundance of life here makes it a perfect rest stop for migratory species like bluefin tuna, blue sharks, and the highly endangered North Atlantic right whales and humpback whales. I couldn’t wait to get out to this ocean oasis! Why had I never heard of it before? I had sailed right by it numerous times, but knew nothing about it, nor of its importance. Rachael Miller, founder of Rozalia Project, is an experienced remotely operated vehicle (ROV) pilot; and with Rozalia’s small ROV and its HD camera aboard, we made plans to head out to Cashes Ledge to document this kelp forest and the abundant marine life found therein. The challenge of Cashes Ledge, and why I believe I’d never heard of it, is that it’s hard to get to and document! To deploy and operate an ROV, conditions must be fairly tranquil. A good time to go would be August when conditions in the Gulf of Maine are more typically calm. However, to get the clear underwater photos and video, it’s essential to beat the summer plankton bloom which drastically reduces visibility and clarity. This leaves a very narrow window of opportunity. Aboard American Promise, we analyzed the weather charts and looked for a three-day weather window to get out to Cashes Ledge. We needed one day to sail out, one day on the ledge and one day to sail back. Once on the ledge, our limiting factor was the need for wave heights of less than two feet to safely deploy the ROV. Cold front after cold front rolled through, and forecasts of four- to five-foot seas were persistent. Our window of opportunity closed a little each day. While we waited for the ideal forecast, Rachael and the six interns practiced flying the ROV along the coasts of New Hampshire and Massachusetts. We made some exciting discoveries. Near the Isle Of Shoals we found thick shotgun kelp forests. There was an abundance of life with numerous fish swimming amongst the fronds, and wall-to-wall sand dollars. We deployed the ROV onto Stellwagen Bank and found plenty of flounder, lobster, sculpin and snails along the sandy bottom. On the surface, dolphins and whales helped dispel our woes of not getting to Cashes Ledge. In contrast, we examined regions of Ipswich Bay and Cape Cod Bay that have recently been bottom trawled, and found very little life. Our weather window shut completely for Expedition PROTECT, and we never made it to Cashes Ledge. Our observations, however, were further proof that Marine Protected Areas really do work! There is a proposal by the New England Fisheries Council to re-open many of the currently protected areas to destructive bottom trawling and scallop dredging including Cashes Ledge. The ocean is fighting other battles right now, including acidification and warming temperatures. Rozalia Project urges you to act in favor of preserving our own backyard marine protected areas, it’s more important than ever. To sign a petition to Save Cashes Ledge, log onto rozaliaproject.org/take-action/lend-yourvoice. Ben Carey and his wife Teresa own and operate an ocean conservation media company called Ocean Courier (oceancourier.org) and an offshore sail training leadership expedition company called Morse Alpha (morsealpha.com). Look for a review of One Simple Question (simplequestionmovie.com), their soon-to-be-released documentary film about sailing and living simply, in an upcoming issue.